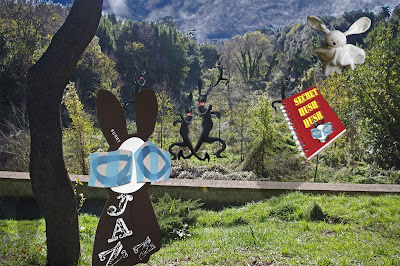 The Wabbit couldn't help glancing up as Ghost Bunny deliberately dropped his fake plans for the Agents of Rabit. He did not look behind him, but in his fur he could feel them rejoicing and he could hear evil cackling as they tore across the field to grab his notebook. The Wabbit had thought for a long time about what to write to lure his enemies into a trap. After several attempts he wrote. "Higglemus, pigglemas, seven days after Sqigglemus." The Wabbit wondered if that was difficult enough but he pondered for a while and continued. "We will find ourselves in the pink on the high hill - and there behind the shuttered door, all secrets will be revealed." He then sketched a map with careful directions and made some random doodling in the shape of farmyard animals, which he then filled in with colourful crayons. But the Wabbit thought it needed something to make it complete and he had another think. Then he started to smile and he wrote. "O si vile, si ergo, Fortibus es inero! O nobile, demis trux, Vadis indem? Causem dux." "What in Pluto does that mean, Wabbit," asked Ghost Bunny. The Wabbit started chuckling and couldn't stop. "Wabbit!" shouted Ghost Bunny. "OK OK," said the Wabbit, "you just have to say it properly. It's "Oh see, Billy, see her go! Forty buses in a row! Oh, no, Billy, them is trucks. What is in them? Cows and ducks."" Ghost Bunny looked at the Wabbit and shook her head just like Lapinette. "I've been saving that one for the right moment," said the Wabbit.